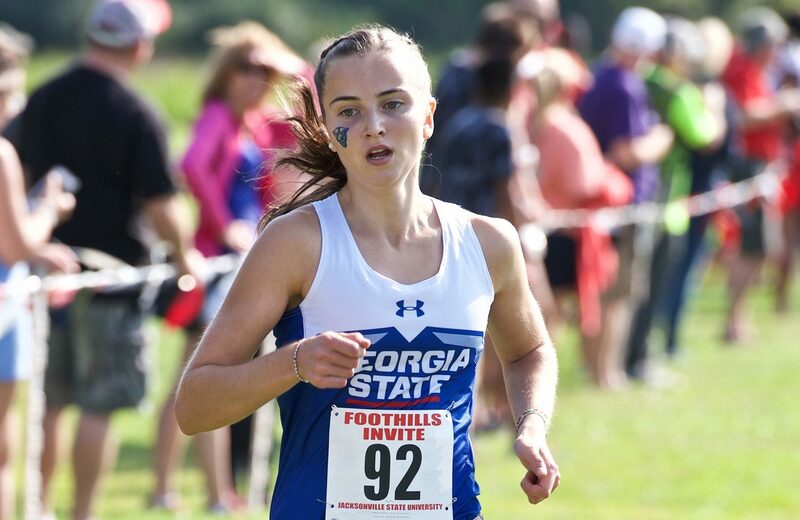 The Georgia State cross country team is set to kick off another season, one where the team has set higher expectations for itself. The Signal sat down with Lotte Meyberg, the team’s top runner, to talk about her sophomore campaign and the things that make her such a good runner. Last year at the Sun Belt Conference Championships she placed seventh and made the all-conference team. Head coach Chris England is set to begin his ninth season at Georgia State, and he believes that this is one of his best groups yet. The Signal: How has your time been so far here at Georgia State? Meyberg: It’s been really great. I feel like I’ve developed continuously and have improved my times. In Germany, you don’t really have a cross country season; it’s not as big of a sport there. So, last year was actually my first real cross country season, and I really enjoyed that, and I feel it’s something that I’m good at. The Signal: What one word would you use to describe your abilities as a runner, and why? Meyberg: I’d say ‘perseverance’ because I think everyone has bad days and sometimes it’s tough, and it’s never easy, but if you want to achieve something or you have a goal in mind you just have to keep going because at some point you will reach what you plan to do. The Signal: What accomplishment are you most proud of? Meyberg: Last season, I was very proud that I won one of the races. It wasn’t a big race, but heading into the race, I wasn’t thinking about winning. With 800 meters to go I just gave it all I got. I was so surprised that I won the race and that was something that just gave me a lot of confidence for the other races. The Signal: How did it feel last year when you made the All-Sun Belt Conference Team? Meyberg: Great! Honestly, before the race, I didn’t even know that you could win a trophy for seventh place. So I was like, ‘That’s awesome!’ I didn’t even think about placement before going into the race. I just ran and did my best, and the best was good on this day, so I was really surprised, but I was also of course very happy and pleased with my performance on that day. The Signal: What does it take to be a good cross country runner? Meyberg: Perseverance, motivation, a good team and a coach—a coach that you can trust. It can get tough, it hurts to run as hard as you can for 20 minutes, but if you want to do it you just need perseverance and a good team who can carry you on. If you have teammates that you look up to help you and motivate you then it’s very easy. The Signal: Do you have superstitious pre-race routines? Meyberg: I eat the same breakfast: a banana with peanut butter, maybe some oatmeal and a cup of coffee. Some people say it’s weird that I drink coffee before a race, but I need it to get me going. And I have a lucky charm which is a stuffed unicorn that I always bring with me before the races. The Signal: How did that start? Meyberg: I don’t even know how it started, but there was a unicorn hype, and I just took a liking to them. It’s pretty awkward, but I have a lot of things with a unicorn on them. My friends tease me about it, but it’s a funny thing. The Signal: What’s the overall outlook for the team this year? England: The outlook is great. We have a very strong team of returners; we have five newcomers that are also very promising. So, a very deep team, which is something we haven’t had for a few years. We’ve always had a few very fast runners, but not many fast runners. So I’m very excited to have numerous cross country runners who can contribute to the team. The Signal: What are some of the goals for the team this year? England: Our goal every year is to perform the best at the Sun Belt Conference Championship, and that’s at the very end of the season. Of course, we have a whole schedule of competitions so those are for the runners to get stronger and faster and more mentally prepared. Those are just our running goals, but of course, our team has outstanding academics, so we want to continue that trend. Previously, the team has won the Sun Belt academic award for highest GPA and the award for highest GPA inside Georgia State Athletics. We also want to continue to be a presence in the community as well. The Signal: You mentioned the goals for this season, but what are the expectations? England: They set high expectations for themselves. I have my own expectations, but I don’t share those with the team. I let them figure it out amongst themselves. And when you have a group of 13 runners who are all very good, they figure out what they want to do. They’re all very competitive so they push each other and it makes my job easy because they want to succeed as a group, so I don’t have to share my expectations because their expectations sometimes exceed mine. The Signal: What were some of the things you wanted your runners to work on during the summer? England: Just to have fun. Once cross country season is over in November, this same team runs track from January through May. They basically compete from August through May, so it’s a long year for them. They really don’t have an offseason until then, so I tell them to have fun because when school begins, it’s nonstop until May.